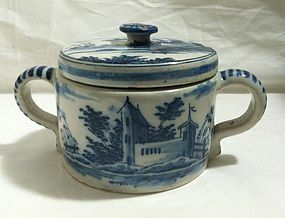 A low covered pot with jug ear handles of tin glazed earthenware with underglaze blue decoration on either side and on the top depicting a house near water. These pots were used for soft cheese, sort of like cottage cheese if I understand correctly. The top is loose fitting but the raised lip of the pot fits into a channel in the top. 4 ¼ inches tall by 8 inches across handles. (10 x 20 cm). 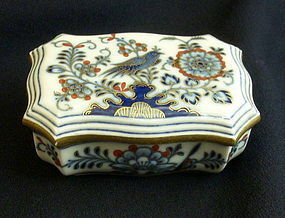 A well potted round covered box with underglaze blue decoration and extensive gilt outlining of the pattern of a bird in a bush. 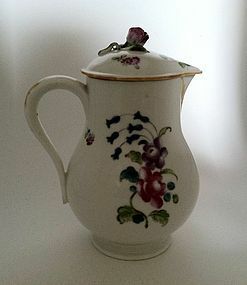 The Meissen crossed swords mark on the bottom is typical of the late 19th century. 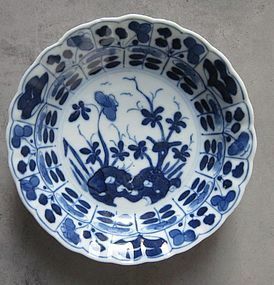 There is also in underglaze blue the number 46, which is probably the identification of the painter of the scene. 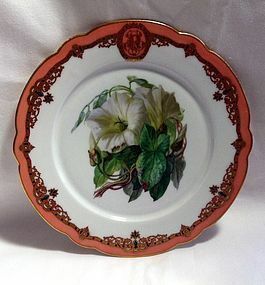 Height 2 ½ inches, diameter 3 ½ inches (6 by 9 centimeters). Condition: no chips, cracks, hairlines or repairs. Very slight gilding wear. 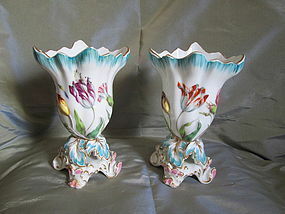 Pair 18th century Italian majolica drug jars. 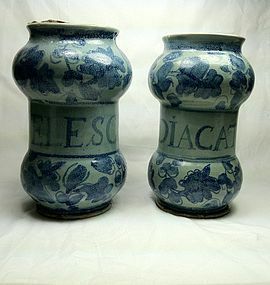 A pair of dry drug jars decorated with blue leaves top and bottom and the drug name in the middle, all over a light grayish blue glaze. 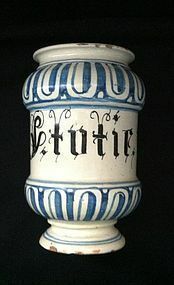 This form is typical of the 18th century Italian drug jars. 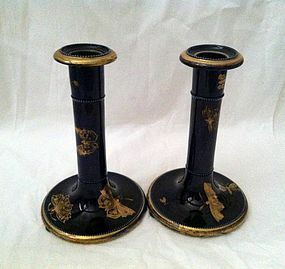 The hand throwing on a wheel is evident on the glazed interior of both jars. 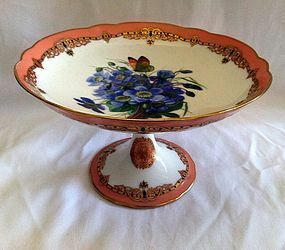 7 ¼ inches tall and 4 ¾ inches diameter, (18.5 cm tall, 12 cm diameter). 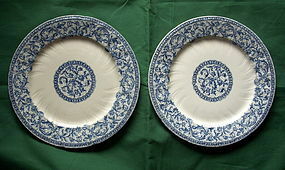 Condition; Both have chips on the base and roughness from throwing on the mouth. 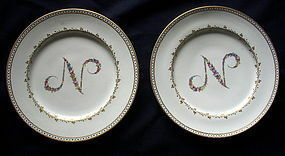 Both have later marking on the base with a magic marker. 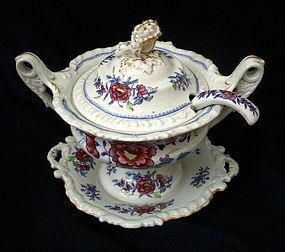 A molded roughly round stoneware small tureen with attached under tray, elaborate lid with finial and simple ladle. 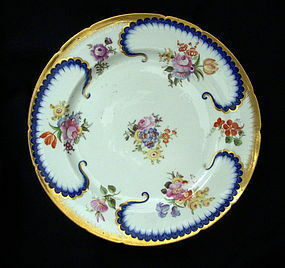 All transfer printed with blue floral sprays enhanced with overglaze enamels. The spoon with an additional transfer of water and a plant in the bowl. 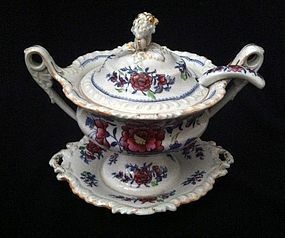 The lid and tureen with gilt highlights especially on the rams head cornucopia finial. The edge of the lid gadrooned, the handles with leaf decoration and the base with more gadrooning and small flat handles. 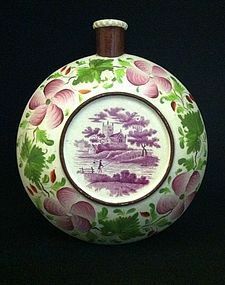 A well made 18th century Italian dry drug jar. The body is a red clay covered with white slip then painted in blue with a dentil style pattern at the top and bottom with the name of the drug in the central section. The inside is similarly covered in white slip and shows the ridges from being turned on a potter’s wheel. This jar would have been part of a set of jars used for dry drugs in a pharmacy. 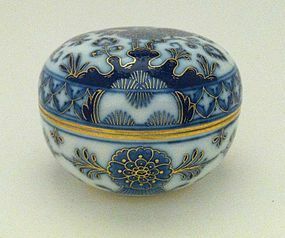 7 ¼ inches tall and 4 ¾ inched diameter. 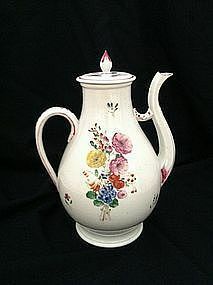 (18.5 cm tall, 12 cm diameter).